We're not open 24/7 and we appreciate that there may be times when you need to check a tartan for your own customer urgently, so here's a FREE service we offer trade customers. You can use the SEARCH button on the left to explore our website for the tartan ribbon you're looking for but for a much more comprehensive search of all tartans, why not visit the web's most advanced tartan search facility? 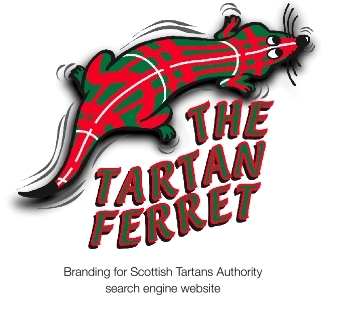 The Tartan Ferret is, by far, the most powerful tartan research database and search facility on the web. In fact, the Tartan Ferret is a marvel! The Tartan Ferret will guide you through the International Tartan Index - an important and invaluable resource maintained by the Scottish Tartans Authority. You can search by entering your surname, clan, tartan, category (eg town, region, American military); you can search alphabetically or even by entering your favourite colours and the little furry friend will guide you through thousands of registered, authentic tartans to what you're searching for. Please remember that of the 5,500+ tartans now registered with the Scottish Tartans Authority, only 40-or-so are produced in ribbon. The Tartan Search facility helps you find tartan, not tartan ribbon, but it's a fantastic tool to help find which tartan ribbon is the closest to the tartan you're looking for. Just PLEASE remember that this facility is to allow you to find a tartan - you then need to use your own experience and judgement to find the closest available tartan ribbon.